Continuing our series of case studies with key publisher partners who are successfully monetizing their app inventory with Smaato's SPX, we now have a new case study available with Live Tiles. They're one of the top app developers in Thailand, with four mobile applications launched to the public and a combined total of more than 30 million downloads. Notable apps include GMaps+, Music+, Ringtones+ and Tube HD Download. We've just published a new case study that looks at how one of our key publisher partners, Ximad, uses our SPX platform to easily customize and manage their inventory. In 2015 we’ve had enormous success in driving the right advertiser traffic to their popular downloadable games like Magic Jigsaw Puzzles, and the results speak for themselves. We’re big fans here at Smaato of Paul Kemp’s The App Guy podcast, and recently had the good fortune to have our own Ajitpal Pannu interviewed on the show about ad blocking, native advertising and mobile app monetization in the modern age. Given that readers of this blog are also savvy publishers and advertisers attuned to the world of global app development, we thought we’d turn the tables a bit and interview Mr. Kemp ourselves. He’s a guy who lives and breathes this world, publishing multiple episodes each week with leading market-makers and innovative start-ups within the app economy. Our thought was that he’d be able to shed some strong light on the state of mobile app development and mobile advertising in late 2015, and we were right. Today we are continuing our quarterly release of a new Smaato Global Trends in Mobile Programmatic Report, this time for Q3 2015. It’s a compendium of trends, facts and revenue-impacting findings from across the billions and billions of impressions that traveled across the Smaato Exchange during the third quarter of 2015. We serve up to 6 billion ads each day, across 800 million mobile users around the world each month. Smaato’s Global Trends in Mobile Programmatic is clearly worldwide in scope, and reflects the detailed activity and trends that have developed over Q3 2015 across our wide base of publishers, advertisers and users. In that sense, activity on our Exchange serves as a very strong and very relevant proxy for more “macro” trends happening across the world of mobile. In the third and final video in Smaato's thought leadership series with APAC Managing Director Malcolm Wong, we explore the concept of localized apps, and what they mean both for the delivery of relevant content in their home markets, as well as for mobile advertisers looking to reach targeted and engaged audiences all over the world. Malcolm also discusses how Smaato is able to group local app inventory together in packages that are extremely attractive for advertisers, making them greater than the sum of their parts. App developers looking to monetize their available ad inventory have numerous choices in how to bring revenue (in the form of advertising demand) in the door - from their choice of platform and ad serving partners, to the ad units they wish to display in the app. One particularly relevant question is how to integrate with a chosen mobile advertising platform and ad exchange. Should you integrate via SDK, API or Ad Tag? An SDK is by far the most effective way to create a technical and monetization-friendly link between your mobile app and your chosen platform, and offers numerous advantages over both API and Ad Tag integration. Mobile publishers and app developers are instantly faced with a litany of choices when it comes to monetizing their content within their apps and mobile websites. Even deciding up front how best to configure your ad units for your app or website can be tricky; but don’t worry - at every stage of your post-development journey, from initial ad unit decisions to full optimization and management of your mobile advertising inventory, Smaato is here to help. We’ve been helping mobile publishers make money with our mobile-first advertising platform since 2005, and we’ve seen a few things. Download the new Best Practices for Mobile Publishers and App Developers: A 5-Step Process for Monetization Success, and you'll learn some of the best ideas we recommend based on this experience. We've just published a new case study that looks at how one of our publisher partners, ASKfm, moved beyond the legacy "waterfall" model of mobile programmatic buying and landed on Smaato as a key engine for monetizing their global social network/Q&A network. ASKfm had been searching for Smaato's Dynamic Demand technology for a year in an effort to eliminate the problems that come with the typical “waterfall” or “daisy chain” model. They also needed a reliable partner with high quality standards who understood the challenges and value in monetizing mobile traffic from countries around the globe. The results speak for themselves. Today we’re announcing a big boost to our SPX platform to provide our publisher partners with some exciting new monetization tools to get them ready for the busy Q4 season. SPX now includes a super-simple “point and click” native advertising builder, which allows publishers to take advantage of this proven revenue driver, and to deliver native ads where they might have previously delivered banner ads or interstitials. It’s the first fully-functional native ad builder for mobile publishers, and it makes these ads easier to create than ever before. 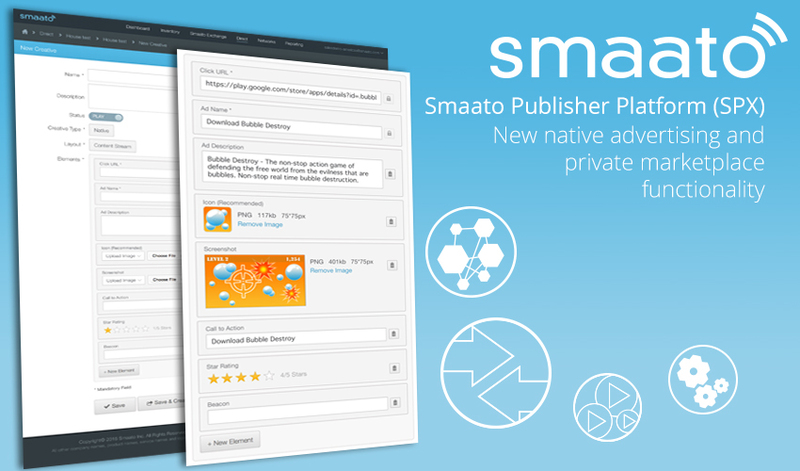 Publishers who use Smaato’s platform are now fully empowered to build native ad campaigns in a variety of formats and sizes that they know will look best in their apps or websites and connect with their audiences best.